YOU CAN NOW USE PAYPAL TO PAY YOUR DUES!! Want to pay using PayPal? Visit the Membership Renewal page to select the appropriate payment amount, then click the “Buy Now” option. 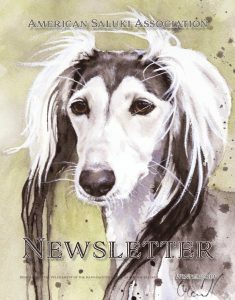 The Winter Newsletter will include the ASA Celebration Weekend, the Saluki Club of Greater San Francisco, the Empire Saluki Club’s Summer Splash Specialties and more! Showcase your dogs with a color or black and white photo advertisement. Paying for your newsletter ad is easy using PayPal. Or you can send a check to our editor made out to the ASA. Camera ready ads are very much appreciated. Don’t know how to submit a camera ready ad? Contact our newsletter editor, Tracey Larkin Cox. The ASA Newsletter staff has several graphic artists who can help you with or do your ad for you. MEMBERS PLEASE NOTE: We have taken contact information for all officers off of the website due to continual spamming, phishing and fraudulent activity. If you would like a digital copy of the current ASA Membership, please contact the ASA Secretary. Also, you must be a member to request and receive your Membership listing. Thank you!